People have been buzzing about a new rewards/GPT site called InstaGC, so I signed up myself today to have a look around and give you all the details. I know it does seem like most GPT sites are one and the same — they usually have the exact same methods for earning, the same offers you can fill out, etc. But there is often a difference in how and when you can get paid, and InstaGC is definitely different in that regard. As the name implies, you can get paid instantly! I love instant pay sites. This site has been around since 2011 and they have a good reputation so far. At this time, InstaGC is only open to the US, UK, Australia, and Canada. InstaGC pays in redeemable points, but it's not a confusing system. Currently 100 points is equal to $1, so it's easy to just glance at your point total and figure how much actual money you have in your account. You only need to have $1 (100 points) to redeem for something. 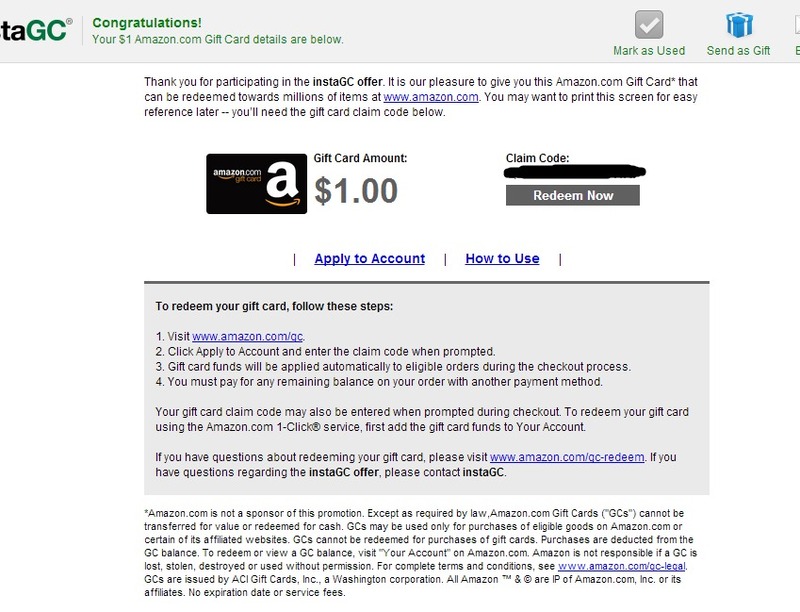 Most of the gift cards will come to you via email instantly after you ask for them unless it's one that has to be mailed. But if you want actual cash, you'll have to wait on a check to get mailed to you. InstaGC doesn't currently have an option to redeem for Paypal. The minimum for requesting a check is the same as it is for anything else — just $1. Or you can of course wait and let your earnings build up and then request a check for a larger amount. What gift cards does InstaGC have? They have many! And most importantly, they have Amazon. I'm sure this is their most popular option. But they also offer Walmart, Target, Starbucks, Barnes & Noble, and several other retailers. Does InstaGC have a referral program? Receive 10 points for each member that registers and confirms their email address from using your referral link. In addition, receive 10% of the earnings they make (excluding any instaGC tasks completed or bonuses received). And remember that the 10% of earnings you get from the people you've referred doesn't come directly from their account. They still get to keep all their money. This is just a bonus that InstaGC gives to you for referring people. There is no cap on the number of people you can refer. What do people say about InstaGC? Overall, the feedback is good. People are getting their redemptions and getting them fast. You're always going to find a few complaints out there, but lots of times people complain about sites like this because their accounts got shut down due to them breaking the rules. And then there are some people who really might not have knowingly done anything wrong but still lost their account anyway. Just be careful and make sure you don't violate anything in the InstaGC terms and conditions and you should be fine. Go here to sign up (they just ask for some very basic information) and then check your email for the confirmation. Click the link in that, and you should be able to log in and get started earning. InstaGC will give you 10 points just for signing up. This post contains my InstaGC referral link. This is actually not a new rewards site. It far surpasses any other site out there. How do I know–I’ve earned over $5000 using ONLY instaGC. Update – We now have Paypal on instaGC.